You are here: Home » Tech News » 7 Project Management best practices and Top Marketing Professionals Incorporate Today! January 29, 2018 (PowerHomebiz.net) From time to time, the marketing industry has grown tougher, and success is something that is hard to come by, which every marketer aims for. To differentiate and stand-out amongst their competitors in the rapidly changing world of marketing, marketers are learning project management skills to keep control of each project they undertake. Effective Project Management has become a necessity for Marketing Professionals to run a business smoothly. These skills will help marketers reach their target audience which in turn will lead to increased profits and result in consistent success. A project manager works closely with the marketing team to implement strategies, designs, and initiatives to manage work. The team is always welcomed to contribute ideas, and these ideas are implemented by the project manager to observe its potential. The key responsibility of a Marketing Project Manager is to oversee the use of various marketing techniques to promote the company. He is also assigned to the duties of handling a single product or the whole team of the company. The methods they incorporate include online campaigns, brochures, press release, and other editorial material which will help in promoting the brand and spread awareness. a. Project Automation – Project automation is important to avoid overburdened manual work which will help in filtering out the productive and non-productive project work. b. Elimination – The elimination method will help in sorting out the less important work from the scheduled working list which will benefit from catering excess time to execute more projects. c.	Maintenance – The maintenance method will help the project manager to apply minimal time to long-term projects to ensure they provide maximum output. Effective communication should exist amongst team members to build a strong community and help the team feel confident while working on a project to outperform expectations. It is quite tough for people to get started if there is no scope for open discussions. Open communication is helpful to shape and define company goals. Project managers are required to use the right tools to streamline internal communications. For example, ProofHub, Skype, and HipChat are the tools commonly used to help improving peer to peer communication to voice their messages on related topics. The project manager should develop marketing strategies to ensure that the products or services meet the customer needs. The key benefits of developing effective marketing strategies are to drive upsells, increase brand loyalty and generate new business. Project managers will face situations where the team is mangled in the complexity of low impact projects and are likely to spend too much time which will ultimately kill the company’s marketing performance. To avoid such circumstances, the project manager should link the marketing projects to marketing strategy to maintain agility and autonomy. The key element of successful marketing strategy is to help the project manager to categorize potential customers into groups based on their needs. To accomplish this feat, the project manager has to set a marketing strategy, draw a marketing plan and evaluate the success of the strategy implemented. Planning a marketing process can generate a lot of ideas that seem ideal for marketing a product or service. There are some basic marketing goals that a project manager must concentrate on to tackle projects based on their impact, like – how to bring in more traffic, methods to generate more email subscribers, and techniques to increase customers. These aspects can be met when the project manager defines the goals clearly to the team to allow them to focus on the projects that have a huge impact on the business. a. Create a checklist of prioritized projects. b. Assign projects carefully, along with the tools and budget required. c.	Resource allocation to create value for clients, employees, and agency. d.	Appoint project managers for Smart thinking and strategy. When you are working on a big project you may lose your momentum, so break your big projects into small tasks to manage the whole project easily and avoid unnecessary distractions. Break the content types that make up your project into individual tasks to complete according to your deadlines. We easily get distracted out of the reason when working on big tasks because they are so big. While breaking them into smaller tasks makes it easier to work with. a. Getting insights as to who is doing what. As advanced technology is gaining importance, the complexity in handling projects increases, making collaborative tools the need of the hour at workplaces to support virtual teams. Team members are to be pre-occupied at every stage of the project. To reduce the need for constant meetings, online collaboration tools are being used to share ideas and edit documents. A project management software (ProofHub) will easily run multiple activities, manage volumes of data, track project delays and make documentation accessible to the right team members. 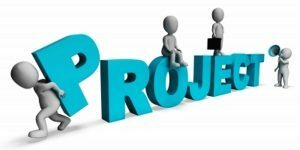 Whether allocating project resources, updating the project, or handling any of the dozens of small issues that will arise as you progress forward, the campaign needs to be kept organized and every detail tracked. That’s where project management does marketers a favor: everything stays within the system, automatically saved and organized. Ryan Grant has written articles on such subjects as Project Management, IT Service Management, Quality Management and DevOps. He achieves this by working hands-on with small business owners, helping them to plan, implement and review their growth strategies. He approaches small business growth one discrete project at a time until our clients have reached their goals.